[Note: The following was first published in the October 2012 Alberta Outdoorsmen. A more recent update was published in the June 2017 Alberta Outdoorsmen and is posted here. As I have related before in this column, Wabamun Lake in many ways represents what is happening in many of our recreational lakes across the province. It is also the most studied lake in Alberta. Stephen Spencer, Area Fisheries Biologist for Alberta Environment and Sustainable Resource Development (ESRD), has done much of the current research on the fisheries. He recently spoke at a Wabamun Watershed Management Council meeting and some of the following information was gleaned from that presentation as well as the 2004 David Schindler report, “Lake Wabamun: A review of Scientific Studies and Environmental Impacts” (available at www.wwmc.ca). 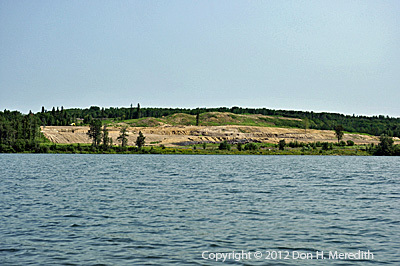 Wabamun Lake has probably been fished as hard and for as long as any lake in the province. As early as 1850, the lake was heavily fished to supply the people at Fort Edmonton and area, most likely to feed sled dogs as much as people. This pressure increased into the 20th century as the importance of the lake fishery as a source of food grew and was enhanced with the building of a railroad to the lake. In 1910, weekend railway excursions were organized from Edmonton to the lake, increasing sportfishing pressure. The building of cottages began shortly thereafter. 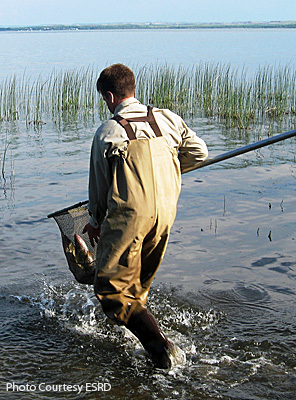 In the past, Wabamun has had viable native populations of lake whitefish, northern pike, yellow perch and walleye. However, the walleye population was fished-out by the early 1900s. Commercial fishing of lake whitefish continued but the whitefish population cycled wildly from low densities to high and back again, most likely because walleye were no longer controlling whitefish numbers. As the number of anglers increased over the decades, the demand for whitefish and northern pike exceeded the capacity of the lake to supply. As a result, the government closed commercial fishing on the lake in 2004 and imposed catch-and-release only fishing in 2008 to allow fish stocks to rebuild. Workers placing booms to trap oil spill on Wabamun Lake. The 2005 CN train derailment and resultant oil spill was a major disaster with potential to significantly affect the health of the fish populations. After some initial missteps, industry, governments and concerned citizens did come together to clean up the spill and mitigate the effects on the environment. As a result, most adult fish survived well but Alberta Health initially found low levels of polycyclic-aromatic-hydrocarbons (PAHs, indicating fuel oil contamination) in the tissue of fish in the lake shortly after the spill. These chemicals did not persist as no traces were found in the fish within a couple of months. On the other hand, studies by Fish and Wildlife indicated that PAHs affected the survival of whitefish eggs. They found a significant increase in deformities in embryos that lowered the survivability of the fry. As a result, the whitefish population has not recovered as quickly as hoped. The presence of mercury in fish flesh continues to be a concern. Mercury enters the air from the burning of fuels, such as the coal in the power plants near the lake, as well as from forest fires. It can also travel long distances in the air from sources around the world. The mercury precipitates out of the air through rain or snow and is deposited in the lake sediments. Bacteria convert the mercury to an organic form that is passed up the food chain. The problem is that the mercury does not leave the animal, and the longer the animal lives and the higher up the food chain it resides, the higher the mercury concentration. Such mercury can cause serious health problems in humans and other fish-eating animals. Prior to the catch-and-release only regulation, the concentration of mercury in Wabamun fish was not large. Since 2008, ESRD has noticed an increase in mercury levels in the Wabamun northern pike population, exceeding consumption guidelines in some cases. 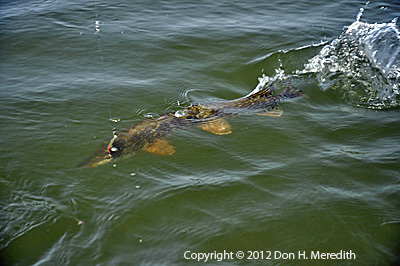 This might be a result of catch-and-release fishing, allowing many older pike to survive and continue accumulating mercury. Whitefish have lower levels of mercury in their flesh. Fisheries biologist Stephen Spencer releasing walleye into Wabamun Lake. One of the most interesting developments over the last few years is the latest attempt to reintroduce walleye into the lake. Fish and Wildlife has tried several times to reintroduce walleye into Wabamun Lake. However, those introductions were not successful because the fish could not successfully reproduce. The fish attempted to spawn too early in the spring because of the warm water outflow from the Wabamun power plant. When the eggs hatched much earlier than normal, the young fish entered the colder lake and could not find enough food to sustain themselves. The Wabamun power plant is now closed and the lake freezes over completely. As a result, introduced walleye may have a better chance at being reproductively successful. With the support of TransAlta Utilities, the Fish and Wildlife Division began transferring adult walleye from Lac Ste. Anne to Wabamun Lake in 2010. Hatchery-raised walleye were introduced into Wabamun in 2011. These fish were produced from nearly two-million eggs taken from spawning walleye in Lac Ste Anne and raised at the Cold Lake Fish Hatchery. 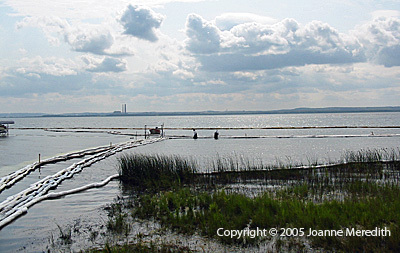 While most were released in Wabamun, a portion were returned to Lac Ste Anne so that lake’s production would not be compromised. The spawn camp at Lac Ste Anne continued this year, and 6.5 million fry were released into Wabamun, along with some adult walleye. To date, 1500 adults have been transferred. Environment and Sustainable Resource Development is hoping to have a harvestable walleye population in Wabamun within the next three to five years. Northern pike in Wabamun Lake have grown to trophy sizes normally found in northern fly-in lakes. Spencer reported that, because of catch-and-release-only fishing, many northern pike in the lake have grown to 90 cm (36 in.) and more in length. Those are trophy class fish normally seen only in northern fly-in lakes. It is these larger fish that have higher concentrations of mercury in their flesh. So, there is an argument to be made to protect these big fish by retaining the catch-and-release policy for at least pike above a certain size, and maintain Wabamun as a trophy lake for northern pike as many sport fishing lodges now do in the far north. Another fish that is responding well is the yellow perch. They are increasing in number with some growing to 24 cm in length. Because whitefish numbers have not improved and the building walleye population needs protection, catch-and-release-only fishing will continue on the lake until at least the walleye introduction is done. In the meantime, ESRD will be discussing with anglers what they would like to see happen on the lake with regard to the fisheries. Like other recreational lakes in central Alberta, Wabamun Lake is threatened by unregulated developments like this one along the north shore near Fallis. 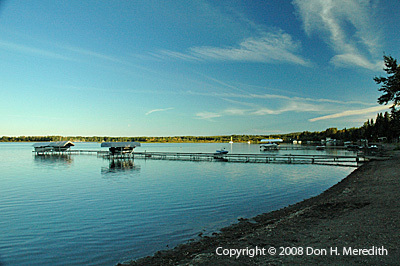 Despite the oil spill and being one of the most popular lakes in the province, Wabamun is a relatively healthy lake when compared to other recreational lakes in central Alberta. For example, Wabamun does not have the blue-green algae problem found in many lakes. However, that could change if steps are not taken to curtail the amount of nutrients and sediments entering the lake as a result of land disturbance. As illustrated by the photo of the recent development on the north shore of Wabamun, our municipal and provincial governments appear unwilling or unable to stop development near lake shores and maintain the values people come to the lakes to enjoy. Isn’t it time to step up and say enough is enough? This entry was posted in Alberta, Alberta Outdoorsmen, Conservation, Fishing and tagged Alberta, Alberta Environment and Sustainable Resource Development, blue-green algae, Cindy Dolanz, CN, enforcement order, ESRD, fisheries, fisheries management, freshwater oil spill, lake whitefish, mercury, mercury pollution, northern pike, oil spill, PAH, perch, pike, polycyclic-aromatic-hydrocarbons, Russel Dolanz, Samco, Samco Developments, train derailment, trophy northern pike, trophy pike, unregulated development, Wabamun, Wabamun Lake, walleye, walleye reintroduction, watershed management council, whitefish, yellow perch. Bookmark the permalink. I usually do not leave many comments, but i did some searching and wound up here Wabamun Lake Fisheries Update | Don Meredith Outdoors. 😛 And, if you are writing at other online sites, I’d like to keep up with everything fresh you have to post. Would you list of every one of your communal sites like your Facebook page, twitter feed, or linkedin profile?